It was a little more than a year ago today, when Ms. Robin Sword trekked down from Las Vegas to Lake Pleasant, AZ; one of the more scenic camping/boating/fishing destinations in the state. Located about 50 miles NW of downtown Phoenix, Lake Pleasant also happens to be within the jurisdiction of Maricopa County Sheriff Joseph M. Arpaio…you know, that guy who is currently being investigated by the U.S. Department of Justice, and the County Board of Supervisors. The feds and supervisors can now add the story of Ms. Sword to their volumes of evidence. The first night of the trip, May 22, 2009, was exactly what Ms. Sword expected…sun, fun, and friends. But it was the following afternoon when the 20-year-old daughter of Ms. Sword’s friend called her mother and said she would be joining the two of them at the lake. The daughter arrived with several friends, all of whom were under the age of 21. Ms. Sword grew uncomfortable with the situation not only because she did not know any of the new arrivals, but because her friend gave the minors permission to drink beer. But the damage had already been done, as someone in the area called police to report minors drinking. It was 1:30 that Saturday afternoon when Maricopa County Sheriff’s “Sergeant” Brad Licking and “Officer” Ben McNevins infringed upon the camp site. Ms. Sword, who is an 18-year veteran of the U.S. Air Force/reserves and former police officer of 15 years in Idaho, immediately recognized that Licking and McNevins were rogues and were not going to leave without arresting and/or charging someone with something. The two cops began interrogating the minors, and Ms. Sword, knowing that her and/or her friend were going to be charged with a crime, began crying. McNevins started threatening Ms. Sword, telling her she’d better stop crying or she would be arrested. This alleged “police officer” even went as far as threatening to use a Taser on Ms. Sword if she did not stop crying, which only frightened her more. Licking asked Ms. Sword and her friend which one of them gave the minors permission to drink. 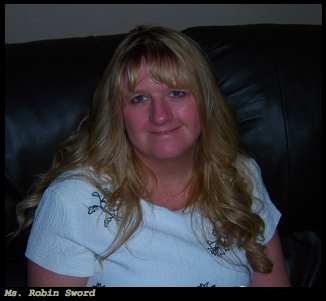 Robin’s friend raised her hand, admitting what she had done. Licking then asked which one of them bought the beer, which Ms. Sword said she did. The “officer,” after determining who did what, allowed the woman who admitted giving alcohol to minors to leave without being cited. Ms. Sword, now even more upset, continued crying and saying, “I didn’t do anything.” Licking began writing her a citation for contributing alcohol to minors, and for some reason, asked Ms. Sword for her social security number, even though the two cops already had her state issued driver license. When Ms. Sword refused, Licking violently threw the ticket book onto the patrol car, and McNevins slammed Ms. Sword face-first into the ground, twisting and bending her arm in ways human limbs are not supposed to bend, before placing handcuffs on her. After begging McNevins to stop before he snapped her arm, the cop finally obliged. As Ms. Sword stood up, McNevins conjured an excuse for his brutality, telling the assault victim he was forced to rough her up because she “used a chair as a weapon,” which obviously never happened. She was given a citation and order to appear in court on June 30. The next day when Ms. 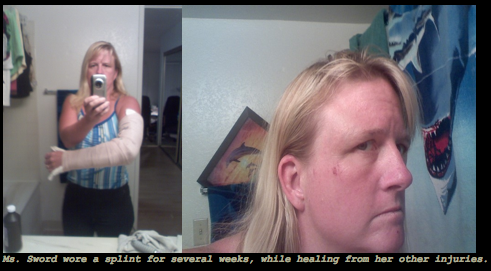 Sword was driving back to Las Vegas, an intense pain in her left arm sharpened as the hours passed. She went to an emergency room upon arrival, where doctors determined her elbow was sprained with possible ligament damage as a result of the assault by McNevins. Ms. Sword also had bruises on her face and arms, and endured four months of physical therapy after her arm was removed from the splint. It is at this point that Maricopa County justice would begin for Ms. Sword. She requested a copy of the incident report, which took Arpaio’s office seven weeks to produce (see redacted PDF of the report here). But it is the content (or lack thereof) contained within the report which is disturbing. “Sergeant” Licking made no mention of Ms. Sword being assaulted by “Officer” McNevins; makes no mention of Ms. Sword’s friend admitting to giving the minors permission to drink; and the report makes no mention of McNevins being present at all. However, none of this conflicting testimony and lying would matter. Ms. Sword would finally go to court on December 17, 2009, where neither Licking nor McNevins showed up for the hearing. The prosecutor said Licking was “the lead investigator in a heart attack case,” and asked for a continuance based on that. The judge denied the request and dismissed the case with prejudice (the charges are permanently dropped). Since then Ms. Sword tried filing a formal complaint with Arpaio’s office when she contacted “Lieutenant” Fred McCann in January. Not only did it take McCann two weeks to return her calls, but she still has not heard back from him (five months later), as far as any pending investigation, if there even is one truly happening. Ms. Sword spoke to McCann via email in April and gave him the remaining information he requested. She has still heard nothing about the complaint as of today. Now Ms. Sword has learned the long, hard way that if she wants justice, she is going to have to take it by her own initiative and then simply hope the laws of the land really work like they’re supposed to. The latter is something Ms. Sword is very skeptical about after being assaulted by those sworn to protect and serve. Ms. Sword has until May of 2011 to file a federal lawsuit seeking redress for the obvious violations of her Fourth and Fourteenth Amendment rights. The pictures above say plenty, but the fact that several witnesses could contradict the MCSO’s allegation that Ms. Sword “used a chair as a weapon” is more than enough evidence to hold Arpaio, Maricopa County, Licking, and McNevins liable for damages (since there is no chance in this U.S. Justice System that the police who assaulted Ms. Sword will be charged with any crimes). A message left at the Maricopa County Sheriff’s Office for comment was never returned. Phoenix Copwatch is a citizen’s group formed in 1998 to combat abuse by the police in our community. We use a variety of means to fight police abuse, including community patrols, videotaping of police activity, and education. Copwatch is completely independent from the police, all other law enforcement agencies, the government, and all political parties. Although Copwatch groups exist in many other cities around the world, they all operate independently, and there is no national or international body that oversees our organization. All of our members are unpaid volunteers who freely dedicate their time to ending police abuse. boo hoo. Do what the cops tell you and there wont be any problems. They broke the law and the law won. Boohoo? Do what the cops tell you and there won’t be any problems???? Are you kidding? This is the United States Of America and EVERYONE has 4th and 14th admendment rights. EVEN those that break the law. CLEARLY.. It is the officers that broke the law. They had a confession. Mrs. Sword was honest and did not lie about who bought the beer. If you listen to Deputy McNevins disposition you can hear lieing all over that thing and I wasn’t there. He doesn’t remember much but… You hear pauses when a question is asked about the abuse. It is interesting enough that he remembers everything except the use of force and the confession that the other adult gave. HMMMMMM If Mrs. Sword was waving a chair around like she was going to hit someone with it then they SHOULD have taken her to jail for assault on a law enforcement officer. Isn’t this a violation of an Arizona statute? Did you read the police report? Does it say ANYTHING about the assault or about having to regain CONTROL of Mrs. Sword by using justified force? NO!!! Does this County have a use of force policy? I would love to read it. Maybe this website can obtain a copy of the use of force policy. Most agencies have mandated policies and supplement “Use of Force” forms that are required to be completed if they had to use force. Are the elements of use of force met in the statute? It would be interesting to read this statute as well. It would be interesting to see what the police academy teaches police about force. Does the academy teach officers to use enough force necessary to effect the arrest then let them go? Are officers taught if they go hands on they own them? Or are they taught if they have to go hands on then they are to let them go and do no such police report. I bet if you ask a use of force instructor they will tell you that if you go hands on then you better cover your *** and write it up because it can come back on you and haunt you and when the time comes for trial you won’t remember much and the report will help refresh your memory. Well..Deputies.. Here you go.. It is now going to haunt you and I hope that you get everything you deserve for abusing a citizen of the United States of America. Mrs. Sword hang in there. Hopefully justice will be served and this incident will be remembered as one that changed the way Maricopa County Sheriff’s Office handles their “Use of Force” incidents. Yes the county does have a use of force board. If they slammed her to the ground That would justify a use of force form. Unfortunantly, they are becoming popular with people who advocate closed boarders and restricted labor movements. This is what I thought. It is now clear to me why Lt. McCann has not contacted Mrs. Sword about her oomplaint. He knows his officers did wrong. Mrs. Sword is a creditable witness. She has 15 years of experience as an Idaho police officer. She apparently is NOT the average Joe Wouldn’t she know what excessive use of force is? i was wrongfully impounded by Washington State Patrol trooper Dustin Drout Badge# 433. Today 01/14/11 i had court to get impound fee back and he came out and lied Under Oath about my distance from DNR Gate which i hunt. i was at least 10 yards from gate out of way BUT he, the dirt bag that he is said i was less then 15ft from it. i heard about Pigs lying under oath BUT i finally experienced it personally. This is a sad story, what happened there is unacceptable. The two cops should be given wigs and skirts to see what is like to be a woman and to cry if you feel like it. Beating her up was definitely not an option.